The Southern dogface butterfly (Colias cesonia) lives throughout the southern and southeastern half of the United States, Central America, and the western portion of South America. It may occasionally be found in the northern portion of the United States, especially during years with mild winters. 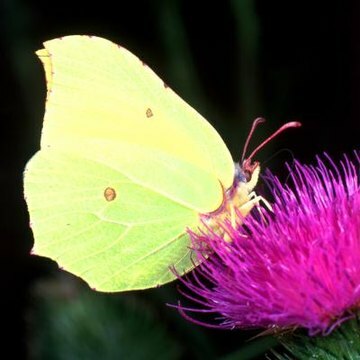 The Southern dogface is often mistaken for the cloudless sulphur butterfly when viewed from the side, but the cloudless sulphur lacks the pattern found on the Southern dogface. It is also similar to the clouded sulphur, but is slightly larger and has wings with a different shape and a border. The Southern dogface butterfly is approximately 2 to 3 inches long when the wings are unfolded. Color varies from a yellowish green to a bright yellow. When the wings are folded or viewed from the side, the forewing has a black dot and irregular border of black or dark brown. Females have yellow hindwings during the summer, and pink-tinted hindwings during the winter. The Southern dogface butterfly prefers open fields and low-growth woodland areas. Prairies and prairie hillsides provide ideal habitats as well. Southern dogface butterflies are easily spotted along the sides of highways and roads, especially during hot, dry summer months. Open pine forests and scrub oak forests are also popular habitats for these butterflies. Southern dogface butterflies seek nectar sources among field grasses and prairie plants, especially alfalfa. Alfalfa provides nectar for adults and serves as food for caterpillars. Other popular food sources include field plants such as white and purple prairie clover, false indigo and black dalea. Plants in the pea family host larval caterpillars, which eat the leaves until they are ready to pupate. The Southern dogface butterfly adapted easily to human encroachment on its natural prairie and grassland habitat by turning to field-cultivated plants and roadside plants for sustenance. It is plentiful throughout the world. In years past it was a rare sight in California and Wisconsin, but recently more frequent sightings have been reported.